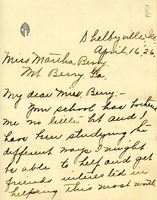 Berry Schools informs Mrs. Lanier that the supply of woven articles is not adequate to fulfill the demand at church bazaars, etc. Catherine Auld writes to Martha Berry that she might be able to help raise money for the schools by selling white and blue cover lids made either by the mountain families of the girls or by the girls at Berry to her friends in the north. Meacham would like to help pay for a young girl to attend the Berry Schools, and asks to be provided with information about the particular student her contribution is used to help. 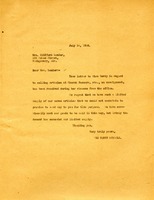 Meacham is visiting her daughter Edith and her husband Reuben Hitchcock, who is stationed in Portland with the Signal Corps. Meacham also inquires whether or not Berry has any homespun linen available.